Comm Eye Health Vol. 20 No. 61 2007 pp 01 - 03. Published online 01 March 2007. MSc Course Organiser, International Centre for Eye Health, London School of Hygiene and Tropical Medicine, Keppel Street, London WC1E 7HT, UK. In this editorial, I aim to show that research is in fact an integral part of learning, and that it teaches the knowledge, skills, and attitudes required for successful eye health work. I also hope to highlight how higher education institutions can support this process. Research projects are often described as providing students with “cognitive, emotional, social and practical experiences”1 which might otherwise be difficult to teach. In order to enable a student to have the best possible learning outcome, therefore, research projects must be clearly structured and students should be supported by the institution and the curriculum. The learning process: how does it work? Higher education training involves student-centred or self-directed learning, since adult students have accumulated considerable experience through their work, life, and education.2 This experience provides the foundation upon which new learning is built. Higher education gives students an opportunity to make observations, reflect on their experiences, and analyse ideas they have accumulated over time. These ideas form the basis of abstract concepts or theories that can be tested through active experimentation. This leads to new experiences, and the process starts again. This cycle of experiential learning, known as Kolb’s learning cycle,3 will continue as long as each new experience is reflected upon (Figure 1). The underlying principle is ‘learning by doing’. 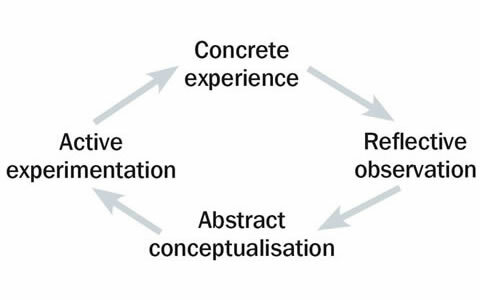 Research projects require a series of stages, from deciding on a project topic to writing a conclusion, which take a student through the learning cycle depicted in Figure 1. Each stage of the research project supports the process of learning. 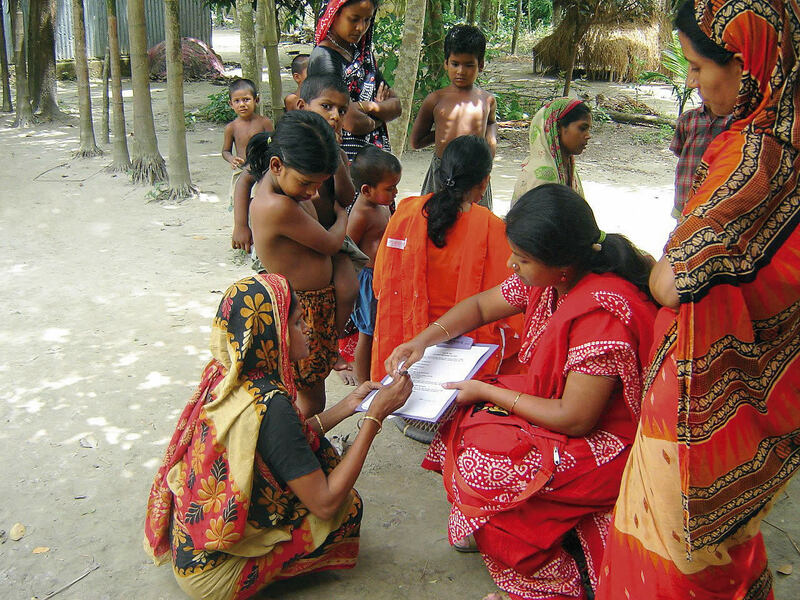 The MSc students whose dissertation projects are described in this issue of the Community Eye Health Journal (page 7 onwards) will all have gone through this learning cycle, irrespective of the subject or methodology of their projects. If a research project is properly supported by both the curriculum and the institution, each stage of the project also results in the student acquiring a wide range of knowledge, skills, and attitudes appropriate for their career development (Table 1). Past experiences and challenges are the starting point for exploring areas of interest. The topic needs to be personally stimulating and relevant. It should not only enable the student to pass the course, but also be valuable to others. Sharing opinions and views with tutors, experts in the field, and other students contributes to the reflective process, enabling the individual to identify a topic or a problem. Students might analyse critical incidents from their professional experience to identify issues for further investigation. Good supervision and a well-designed curriculum enable the student to learn through reflection: he or she becomes familiar with the core knowledge of the research topic, learns to interpret new information, and is able to carefully formulate the research question/problem. Students need to decide on the design of the study. They should also consider what the best methods are for collecting their data, whether qualitative, quantitative, or a combination of both (page 7). Doing this sets the student on the path to conceptualising their views and knowledge. At this stage, students must think about sample sizes, time frames, and budgets. They must also figure out how to gain entry to the research site and how to get consent from subjects/participants. Lastly, they need to put a research team together and obtain ethical approval for their project. Good supervision is crucial in helping students to develop a research methodology that is practical, remains within an allocated budget, and can be carried out within an appropriate time frame. The experimentation stage of the project is often described as the most interesting. Field work puts students’ knowledge and skills into practice. They learn to train a team; to collect, organise, and manage data; and to enter the data into formats ready for analysis with statistical software packages. At this stage, students begin to reap the benefits of the careful and detailed planning that went into the design of their study. When students implement and experiment with the ideas they have formulated in the field, the clinic, or the laboratory, this gives rise to new experiences. This process forms the basis of ‘learning by doing’ – also known as experimental learning. The process of reflection and conceptualisation continues during the next two stages of the research project: the analysis of the data and the writing up of the dissertation. New data give rise to new views and ideas, which are compared to those previously held. This is a particularly educative process, as students frequently find their notions and preconceptions challenged. Writing up the research and communicating the results is an active process and offers unique learning opportunities. For many students, this is the first time they face the challenge of writing a report describing their research, synthesising their findings, and making recommendations. This is an experience which will serve them well in any leadership role. Institutions have a major role to play. They facilitate the success of student research projects and can maximise the learning opportunities for the student. The core subject knowledge is usually embedded into the curriculum and every effort is made to expose the student to the skills required for research. However, students should also, where possible, have access to transferable skills workshops, including courses on interpersonal and communication skills, which will help to prepare them for their research projects. Institutions should endeavour to provide the right environment, including libraries and computing services. Institutions have another important role: they must ensure that ethical guidelines are followed. Projects should not be allowed to proceed unless they have ethical approval from all health authorities concerned. Health and safety regulations must also be scrutinised prior to granting permission to carry out a project, for example if students are travelling to a war-torn region or taking blood from patients. Financial issues should be clearly addressed, with detailed budgets and provision for unexpected challenges, such as insurance for loss or breakage of equipment. Student supervision provides essential support and should follow a clear framework which sets out the educational objectives, deadlines, targets, and assessment criteria. It is good practice to record the different stages in a logbook. This can also help to establish more equitable supervision, so that all students benefit equally from the attention of supervisors. It can be argued that, in educational settings, giving students the opportunity to ‘learn by doing’ is the most powerful method of teaching. One could perhaps even argue that the experience of ‘learning by doing’ takes precedence over the content of the research project. 1 Ludwig Huber. Learning through research. Improving University Teaching 25th International Conference, Germany, 2000. 2 Fry H, Ketteridge S, and Marshall S. A handbook for teaching and learning in higher education. Abingdon: Routledge Falmer, 2003. Never miss another issue. Enter your details below to receive an email when each new issue is published online.